Rocks — despite their reputation for just, you know, kind of sitting there — are actually active to a degree that would make The Rock look lazy. Rocks press on one another. They withstand the pressure of other rocks. And understanding how these forces interact is incredibly important whenever we go digging around through the rocks beneath our feet — which we do a lot. Scientists call it lithostatic pressure: a force that compresses from all sides at the same time. Its strength depends much on how deep in the Earth you’re talking about and on the density of the rocks above, below and to the sides. Scientists measure this kind of pressure in pascals, and it can be a little difficult to connect to everyday experience because, contrary to what Freddie Mercury and David Bowie may have led you to believe, our bodies don’t experience much pressure under normal circumstances. But you can get a sense if you imagine being stepped on by a 150-pound person. As that person stands on your chest and you gasp for breath, you are experiencing about 0.05 megapascals of pressure. At 1 kilometer deep in the Earth, rocks are experiencing an average vertical pressure of 25 megapascals and an average horizontal pressure of 10 megapascals. And those pressures double with every additional kilometer of depth. 2 That’s what we’re talking about. Rest assured, this is hard work. There is no vacation. There is no 10-minute smoke break. Everything is always pressing on everything else. You can even think of the whole Earth this way — like a 3-D, spherical puzzle held together by its own tension. But here’s the thing about those puzzles. When you see them at the toy store, they’re always up on a high shelf, out of the reach of little fingers that might try to pop out a piece … and change the balance of pressure. Humans, as it turns out, are constantly doing just that. We hollow out mines, we bore tunnels for subways, we run sewer lines and pipes full of cables. And all of those things affect the pressures experienced by the rocks and the pressures they produce on other rocks. Understanding what happens when lithostatic pressures meet a tunnel boring machine is critical, but the people who study rock mechanics — that is, what rocks do when we humans start blasting our way through — say this isn’t easy, and it’s getting even harder. We do more underground excavation now than at any other time in human history. That excavation is more important than it’s ever been to human society. And it’s producing problems that are harder than any we’ve ever had to solve, including what might be the ultimate rock mechanics problem — creating the caverns where spent nuclear fuel will be squirreled away for hundreds of thousands of years. After decades of existing mostly as conceptual political footballs, several facilities designed to be permanent nuclear repositories are close to coming online, including ones in Olkiluoto, Finland; Forsmark, Sweden; and Bure, France. All three are expected to be operational by 2025. All three are highly dependent on engineers knowing what rocks do. If those rocks crack in the wrong way, nuclear waste could leak out. You don’t need to get that exotic, though, to see the importance of rock mechanics in modern life. Just think about the city you live in. “When we’ve got really dense population centers, the increased density increases the heaviness of the local footprint,” said Leslie Gertsch, professor of geosciences and geological and petroleum engineering at the Missouri University of Science & Technology. The weight of a big city is enough to change the behavior of the rock underneath. And that effect is magnified by the city’s underground infrastructure — tunnels, tubes and pipes. Especially when the pipes leak. In 2007, a 330-foot-deep sinkhole swallowed three people and several houses in Guatemala City. Water from the city’s aging sewer lines had eroded out soil and soft rock. Eventually, the weight of the city above forced the whole thing to collapse into a straight-walled pit that looks more like an error in satellite image data than a natural disaster. In other situations, collapse is exactly what engineers are trying to create. A method of mining called block caving relies on it. Miners build funnels and tunnels below a big deposit of ore and then blast apart the bottom of the deposit. That rock crumbles and falls into the funnels for easy collection, just like M&Ms falling out of a quarter candy machine. Meanwhile, the rock above has been destabilized. It’s still being pushed on from the top, but now there’s nothing pushing back below. Slowly, it starts to crack and collapse, as well, falling, bit by bit, into the funnels. The data from those tests is used to build elaborate mathematical models that predict the behavior of certain kinds of rock under specific conditions. But squeezing granite like a stubborn zit tells us only so much. These tests have much to say about what a cylinder of rock does, but reveal significantly less about the behavior of rock as a massive unit. They also leave important uncertainties about how different types of rock masses behave as underground neighbors, said Charles Fairhurst, professor emeritus of civil and environmental engineering and geo-engineering at the University of Minnesota. For instance, you might have a nice, solid piece of granite, Fairhurst said. But if there is softer rock above it and below it, then the granite is carrying a bigger share of the weight — the same way your bones support more of your weight than your muscles. Dig a tunnel through the granite, and you could cause fractures that destabilize the whole thing. 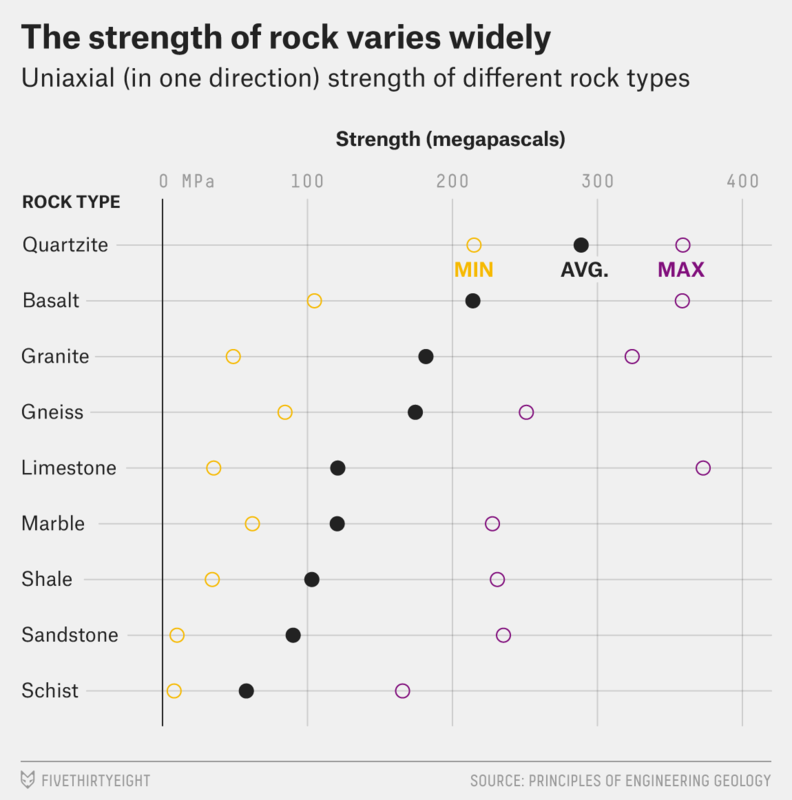 It’s also not enough to just know the strength of granite — you have to know the strength of the specific granite at the specific location where you’re digging, said Andrea Lisjak, an engineer with Geomechanica, a company that does rock mechanics simulation and consulting. Finally, Lisjak and Gertsch said the problem of human time versus rock time is crucial. It’s one thing to know how a rock fractures in the first day, month or year after you tunnel through it — it’s entirely another to know what it will do 500 years later. Or 1,000. All of these uncertainties play a role in the construction of deep underground nuclear waste storage. These facilities are meant to hold nuclear waste essentially forever. The sites are chosen because they are made up of rock that has been geologically stable for tens of millions of years. But that doesn’t mean the rock won’t crack. It will. One of the answers to the question “what does rock do?” is, essentially, that it breaks, Lisjak told me. And it’s definitely going to break when people start tunneling through it to build a nuclear waste storage facility. The trick is predicting how it will crack, and where, and when. Small fractures deep in the Earth aren’t a big deal. Big fractures that reach to the surface, or to an aquifer containing our water, are. Because of the uncertainties, Lisjak told me, making these predictions is much like predicting the effects of climate change — you test different scenarios in the mathematical models and end up with a range of more likely and less likely possible outcomes. There is no single answer. You will never know exactly what is going to happen. But there is one more type of testing that engineers use to help them get their estimations a little closer to exact. At 18 sites around the world, researchers have built full-scale models of nuclear waste depositories. These Underground Research Labs have all the tunnels, technological infrastructure and engineered barriers that a real depository would have. They’re dug into the same kind of rock. They’ve got everything … except the nuclear waste. The idea is that these models can be used to improve and verify what happens in the mathematical models. For instance, Lisjak previously worked at the Mont Terri URL in Switzerland. One of the things he did there was drill out narrow tunnels, exactly the diameter of the ones that could someday be filled with canisters of Swiss nuclear waste. As he did that, he monitored the rock around the tunnels — recording the tiny earthquakes that rattled through as pressure shifted around a new hole. Then, they checked to see how well their computer models lined up with what the sensors recorded. “If you can predict what’s in the field, that’s a good sign,” he told me. No prediction is ever perfect. But every test helps scientists understand what rock does (and what it will do) a little better. And the more we know about that, the safer we’ll be as we dig out bigger, more important projects underground. In the past, we’ve embedded an audio recording here of the child asking their question. It’s pretty cute. Tobias’ dad, Charles, tried for a week to get us a recording of Tobias asking about rocks, but Tobias wouldn’t do it while the recorder was on. Because 3-year-olds. The Tau Tona gold mine in South Africa, one of the deepest mines in the world, is 4 kilometers below the surface. Because pressure increases heat, the mine has to be air conditioned just to keep the temperature at 80 degrees Fahrenheit.